BTW: Not withstanding his appearance in another of my columns four weeks earlier I don’t really have a Nixon fixation. I suffer from a Trump Fixation. Even when I haven’t just returned from France my head is often bursting with thoughts I’d like to commit to the blog. France has only given me lots more with the counterpoint of my very positive experience in France counter to the national trauma I’ve come home too. I’ve been back in the states for 22 hours and watched PBS news hour. I’m reminded of the great war that Gulliver found being waged on the Island of the Lilliputians over which way to open a soft boiled egg. Only its not a trivial issue trying to decide which of two idols is Satan is which is God. 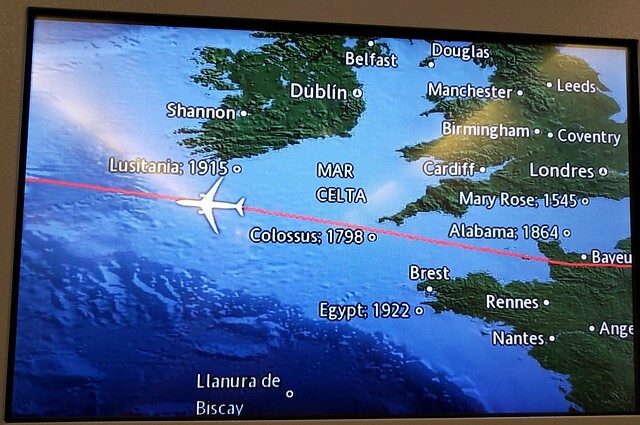 So, here’s a picture of the planes map showing its location as it left France and headed for the US. I thought it was very strange that a plane flying overseas with sometimes fearful passengers would plot the wrecks of sunken ships on a map. More showed up as we neared the US including the Titanic, the Andrea Doria the Hunley and some Spanish treasure galleon. That’s a much less significant question than how America will come to its senses. I don’t have an answer to either question at the moment. I’m going to bed. Good night. Every man is a moon and has one side he never shows the world. Until the era of Internet. I caught the end of a BBC broadcast early this morning which I found engrossing and then tuned into On Being while I ironed wrinkly t-shirts brought back from China – all short sleeved. It was the second time I heard Margaret Meed’s anthropologist daughter Mary Catherine Bateson being interviewed on “On Being.” Claudia was up early and listened too. Bateson is a practicing Christian unlike her parents who did read the Bible but as Atheists/Agnostics. It was a thought provoking interview even the second time through. Bateson was raised with her Mother’s ethos of participating in life while at the same time being an observer of what is actually happening during that participation. Back in 2015 when I first heard this interview I concluded that this perfectly described how I went through life. Another way of describing this quality is “mindfulness” or even “living in the moment.” Except that, living in the moment suggests not paying attention to the past or the future and that is not me. I think of the past and the future at all times. I joked ith Claudia that we were like one of Bateson’s cells (nucleus and cell) originally different creatures which back in the primordial past combined and found our synergy to be a survival tactic for our separate selves. Bateson used this as a metaphor for marriage. She also noted that it was easier for a couple in the past to stay together because they mostly didn’t live beyond 35 years and never had a reason to separate after raising children because that was generally the end of their life expectancy. Just when I want to chuck my Buddy out the window he offers up a peace offering. I know it won’t last long but if I can’t get over my quarrels how can I expect anyone else to? Denmark’s is setting a good example for us here in North America. I woke up at 3AM yesterday and couldn’t go back to sleep because I was mulling over Trump nation. That happened often last year and the chaotic beginning of his new Administration isn’t offering any peace of mind. I was confused about that because those were the first words to come to me when I started posting. Then I read the prayer and that’s not how St. Francis starts or finishes it. The Serenity Prayer offers good advice especially that last line. Of course, where change is concerned a lot can be accomplished by many people. It took more than one man to make the United States. It will take more than one to bust it up. In the meantime I can be a band-aid or squeaking hinge. If if I’m not sticky enough or the hinge comes loose I expect there will be others to take my place and be more useful. Every nation on Earth could be Denmark – Even the U.S. Fear and silencing in 2016? The initial reactions of many in the wake of Donald Trump’s election have been fearful, ugly, gloating and generally panicky. There is an abundance if not an excess of caution. There has been local Radio talk-show indignation and Facebook hand-wringing over an evidently Anti-Trump message slipped into a school trophy case. It seems proof that political animosity works both ways. The tremors across northern Minnesota Schools yesterday from a vague threat is likely one more manifestation of this sorry situation. 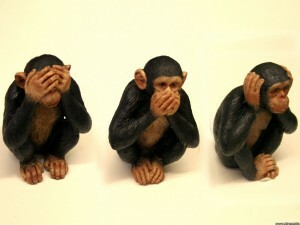 I’m afraid that one more consequence of this election result is a powerful urge to cover our eyes and ears. At Tuesday’s school board meeting Supt. Gronseth expressed unhappiness with the student at Denfeld who took a picture of racist grafitti and posted it to Facebook to show how things were at the school. I’ll bet the police who have just charged a jumpy policeman in the Twin Cities with manslaughter may feel much the same way about Internet Videos. Silence is Golden. I disagree. Communication is golden. “According to 3 equity minded individuals who all saw El-Kati’s talk yesterday at East, they are in complete and utter shock that Denfeld did not get to hear the awesome messages that El-Kati delivered. His main theme was moral character, and also touched on many topics and historical figures such as Thomas Jefferson, John Lewis, Frederick Douglas, Quakers, MLK, war, Minnesota tops in education, Duluth is wonderful, power and privilege, among others. Oh– and Dr El-Kati’s visit did not go as well as hoped. He did not deliver the planned message. He did not meet the terms of the contract. After things did not go well at East, it was decided that the Denfeld presentation would be canceled. Judging by the superlative response of the Denfeld students to racist grafitti I have every confidence that they could have handled whatever Dr. El-Kati had to say. I wish my confidence in our students was more widely shared. At one point a member got up and harangued the audience telling them that they had to go out and register voters to prevent a win by Donald Trump. Whether the candidate’s name was actually mentioned or not that was the obvious message. Not everyone was happy to have it put so bluntly. The good old LWV ain’t what it was when I moved to Duluth in 1974. Back then it was a bipartisan group composed pretty equally of Democrats and Republicans. That began to change that year with Roe v. Wade. Two years earlier I went to a Minnesota State Republican convention that approved a “pro choice” plank in its platform. 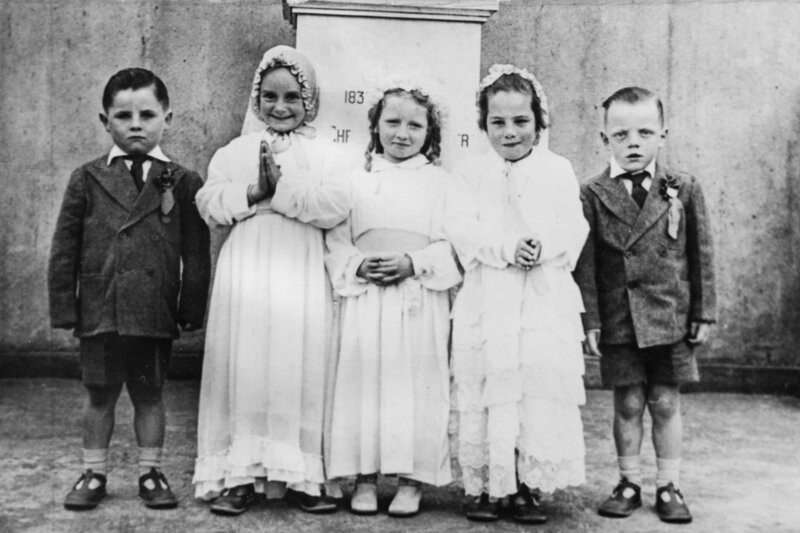 That soon changed as Republicans began to see a huge Catholic block that opposed abortion and as the party’s operatives began encouraging protestant preachers to oppose abortion. At first the protestants, soon to become the Moral Majority, opposed abortion because it made promiscuity consequence free. Saving “babies” was more of a Catholic thing initially. I’ve always thought that for southern Christians, still smarting from having northern Christians chide them for their racism, defending unborn babies gave them back some moral ground. Over the next decade, as once solid Republican League members fell out of favor with the new pro-life Republican Party and all but disappeared taking their pro-choice views with them, the League became a mostly Democratic bastion in practice if not in principle. Its one more casualty of a divided nation. That doesn’t exactly excuse its local members playing partisan politics. BTW – They especially like to dabble in our local school board. Who knows? Maybe he can do it. This is a five minute long NPR story from this morning. By now all of Duluth has heard of racist grafitti on our high school walls. Today a rumor got to me that the Ordean East Trophy case had a vague threat against Donald Trump placed on or in it. The rumor says it was there for a full day and that a parent took a picture of it and furthermore that the Duluth police and even the Secret Service came by to inspect it. The log (or beam) Jesus talks about will tempt many partisans to only see the crimes of “the others” not those of their allies when people overreact to the consequences of this election. A million dollars worth of damage attended the Anti Trump marches in Oregon. I found Black comedian Dave Chapelle’s comment about this noteworthy – “Amateurs.” If it was my storefront I’d be furious but it was pretty small potatoes however ugly. Four years after the post King assassination riots I took a bus through Baltimore and gawked at blocks worth of blackened storefronts behind metal bars. I know that every crowd attracts troublemakers and that all too often they are not anticipated before the crowd arranges itself. The crowd is both an attraction and a good hiding place for mayhem driven far more by mendacity than fury. So the issue to consider in the case of the rumor, should it prove to be true will our District Administration be even handed in dealing with it……if it has or will raise its ugly head? I suppose I could make calls to confirm this but to me the more important point is that we should not take sides. In fact, a threat to the president of the United States is a bigger deal than a racial epitaph. What’s the matter with kids today? That was the question asked in the 50’s musical Bye Bye Birdie. After watching my generation’s reaction to the recent election I’d have to answer – Not much. Before I left the School Board in 2004 Mary Cameron was clamoring for us to bring back student reps to Board meetings. I must tell you I didn’t discourage Mary but I thought the idea sort of silly. They couldn’t vote. They’d be board stiff. It looked like frosting. After three years back on the Board I no longer have that opinion. Sure, They can’t vote. Yep, I imagine they are often board. But no. They are not frosting. I talked briefly to Spencer Frederickson from East high and I was buttering him up by telling him how bright I’d found his predecessors. He said of them that Paul Manning was very political and Jude Goosens very articulate. I added that I saw in Spencer a person with a deep well of caring….or something to that effect. I wasn’t really buttering him up it was the truth. This conversation took place after our student representative from Denfeld, my seatmate Johanna Unden, was lauded by the Superintendent for the video she shot and posted to Facebook in reaction to the hateful messages scrawled on the walls at Denfeld. The reaction? To have hundreds of students place post-it-notes all over Denfeld’s walls with positive messages written on them. This is how to fight the gremlins escaping from Pandora’s box and much better than pronouncements of “no tolerance” for hate. Time and time again I’ve seen our students rise to all sorts of occasions. East Robotics students helping Denfeld’s lagging Robotic’s program. Students advocating for more counselors to help depressed kids organizing to make sure minorities were not left out. Working to make new Freshmen student feel welcome in strange new schools. They put the adults on the school board to shame by comparison. I told Spencer how I remember the old days when Central students shouted unfriendly taunts at East “cake eaters” at Hockey games and how the East students responded with a cheer telling Central kids that their parents worked for the East kid’s parents. Sorry for the false labeling of this post. There is no speck here. You will find them in the next few posts. Confirmation bias has become a subject of great interest lately especially as it relates to the US Presidential election. America won’t heal as long as people with a log in their eyes are only able to see the specks in the eyes of those they disagree with. My Dad, an anti papist if there ever was one, told me that the one thing he particularly admired about Catholicism was the act of confession. That’s not a very popular thing in Today’s America of self absorption. We prefer the ancient Egyptian’s approach to self criticsm. We write “books of the dead” to tell the gods how wonderful we have been so that the gods will let us into Heaven. The Egyptians thought they could sweet talk their gods into ignoring their less than noble qualities. I’m not sure I’m much different. Like most Americans I can clearly see the specks in a lot of other people’s eyes. To help get the recent election results out of my system I need to write about a few of those specks. NOTE that I have corrected this post here. I keep thinking about a truncated discussion we had on suicide after one of our Board meetings last spring. You joined it and dogmatically insisted that schools don’t cause it. Frankly I neither agree or disagree with you. Like Alanna you had a personal family experience that has made you think long and hard about the subject. Below is a link to a thoughtful NPR story about suicide myths that is instructive. About 20 years ago 709 experienced 5 suicides in a period of a couple of months that was described as a spate of copycatting. Today one family is preparing a lawsuit against us for their child’s suicide. I am not a fan of certitude and dogma. The world is a complicated place and I recommend this NPR story as a good place for us to begin a discussion about this sensitive subject. PPS The five student suicides represented several area schools not just ISD 709. Our current Education Reporter Jana Hollingsworth wrote the story.